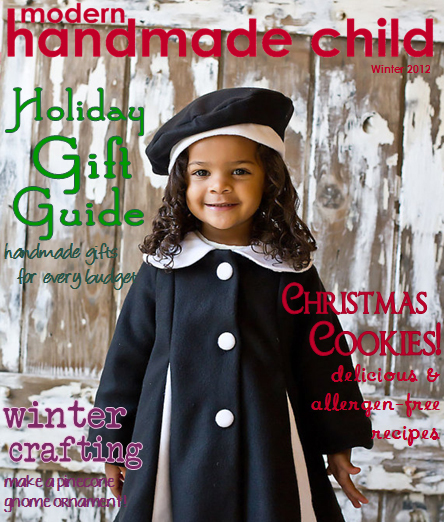 Modern Handmade Child: Winter 2012 issue out now! Winter 2012 issue out now! Winter is quickly approaching, and here at MHC, we are excited to kick off the season as we present our Winter 2012 issue! Enjoy fun winter craft tutorials, delicious and allergen-free cookie recipes, a holiday gift guide with handmade gifts for every budget, tips for living green and getting organized for the new year, and much more! So grab a mug of hot cocoa, then simply click on the cover below to view the Winter 2012 issue! Thanks for the wonderful post, I was looking for for some handmade items and they are perfect.